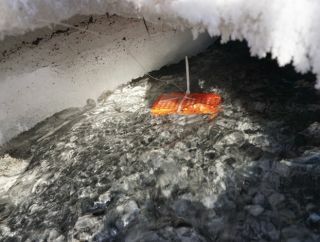 A plate for in-situ microbe cultivation, located within a sub-zero saline spring in the Canadian High Arctic. A small, lightweight life-detection package has passed a key trial here on Earth, suggesting that it could someday hunt for E.T. on Mars or the ocean-bearing moons of the outer solar system, a new study reports. The instrument platform successfully spotted microbes in the Canadian Arctic, a cold and dry environment analogous to Mars, according to the study team. "We wanted to show a proof of concept that microbial life can be directly detected and identified using very portable, low-weight and low-energy tools," added Goordial, who carried out the study while she was a postdoctoral researcher at McGill University in Montreal. Goordial and her team tested a system composed of a miniature DNA sequencer, along with gear for culturing and detecting living microbes. They took this platform to a site on Canada's Axel Heiberg Island, just 560 miles (900 kilometers) from the North Pole. It worked very well, team members said: They isolated and cultured microbes, and also sequenced the little creatures' DNA. "By using the DNA sequencer with the other methodology in our platform, we were able to first find active life, and then identify it and analyze its genomic potential — that is, the kinds of functional genes it has," Goordial said. DNA sequencing run being carried out with an Oxford Nanopore MinION in the team's "lab" in the Canadian Arctic. This approach is a bit different from the one that will be taken by two high-profile life-detection missions in the near future. NASA's Mars 2020 rover and the European Space Agency's ExoMars rover, both of which are scheduled to launch toward the Red Planet two years from now, will hunt primarily for signs of long-dead life. Team members said it will take some time for the newly tested instrument platform to be ready to fly to Mars, or to Jupiter's moon Europa, which harbors an ocean of liquid water beneath its icy shell. "Humans were required to carry out much of the experimentation in this study, while life-detection missions on other planets will need to be robotic," co-author Lyle Whyte, also of McGill University, said in the same statement. "The DNA sequencer also needs higher accuracy and durability to withstand the long timescales required for planetary missions." The detection gear could also prove useful here on Earth, the researchers said. For example, it could help doctors and scientists quickly identify pathogens during a disease outbreak, without the need to bring samples back to a lab. The study was published last month in the journal Frontiers in Microbiology.